Ask fellow campers about "Outlaw Trail RV Park" and nearby attractions. Nice owners. Very rustic no extras We camped at Outlaw Trail RV Park in a Travel Trailer. 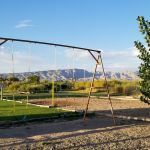 We stayed 3-nights at Outlaw Trail RV Park because the CG (1) is a short 20-minute drive from Dinosaur National Monument, (2) has 30/50-amp full-service sites, and (3) was the only RV park in the area that wasn't full over the Labor Day weekend. As has been stated in previous reviews the CG is definitely "no frills" and a "work in progress." Its sites are long but narrow and closely spaced, so no sense of privacy. There are no shade trees, so AC is a must. The CG is set about 100 yds from the highway, so there is some - but not a lot of - traffic noise A tall chain-link fence separates the CG from neighbors who appear to store abandoned trailers on their property. The bath/shower facilities and coin laundry were clean. 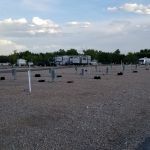 Yes, the CG is a giant, sterile, gravel parking lot - not a place to relax and hang out with family and friends - but we would probably stay again, because the CG is safe, priced fairly, well-managed, and close to Dinosaur NM. We camped at Outlaw Trail RV Park in a Travel Trailer. No frills gravel, level, pull-thru sites, FHU. Grassy tent area and playground. Not at all crowded while we were there. Coin laundry, restrooms-showers are clean (quarter for 5 min for guests). Park is South side of Hwy 40 across from Visitor Center and County 149 going to Dinosaur National Monument. Non-guests: Dump station is $10, showers are $3. CONs: When full, sites are very close; and with just 5 daily sites occupied of probably 80 sites -- they put a tent-trailer in next site to us (had to move a picnic table to do so) which gave neither of us any privacy! 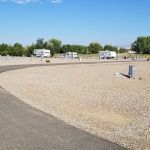 We camped at Outlaw Trail RV Park in a Motorhome. Skeeters Cafe is just a mile West..good! Not a tree in sight and nothing to do in the town. (There isn't really one) We camped at Outlaw Trail RV Park in a Motorhome. The major attraction is the Dinosaur National Monument which is much better seen in museums around America as the artifact robbers were there well before you. Cool, (literally) building with not a whole lot to see. AS Colorado natives, we missed it our whole lives, and that proved not to be any detriment as once was more than sufficient. We had a very pleasant stay at this RV park located along US-40, but with no road noise. The new owners are a very helpful young couple who are continually making improvements. The roads and sites are all gravel. All sites are pull-through, level, FHU, and very long, with a small shade tree. The bathrooms and laundry are clean and centrally located. All utilities worked well. Lots of space around the perimeter to walk a dog. This location is ideal for visiting Dinosaur National Monument. We camped at Outlaw Trail RV Park in a Motorhome. The excellent Utah Visitors Center is just across the street, as is the entrance to the Dinosaur National Monument Quarry Visitor Center. Easy access from US40 but minimal road noise. Very helpful and friendly owner. Sites gravel and open as the owner says the landscaping is a work in progress but all looks great so far. Very clean restrooms/showers and laundry. Opposite the Utah visitor centre. Wifi was very good. We have given slightly less than perfect marks only as our site was a bit narrow but ok. Again we think this is a work in progress. We stayed two nights and were very comfortable here and certainly recommend for an overnighter or more to visit Flaming Gorge and Dinosaur Land. We camped at Outlaw Trail RV Park in a Fifth Wheel. Flaming Gorge Dam and Red Canyon Overlook and Visitors Centre. Totally great stop near Dinosaur National Monument for a few days. Pros: Laundry was cheap maybe $1.25 per wash and $1.00 for dry. The staff was lovely and had great recommendations for what to do. There is a small playground for kids with field right nearby and a couple of nice sitting areas in the campground. Was not very crowded, very easy pull throughs. Cons: There is no shade for sites. You might be able to walk under a tree and get some but none for rigs. 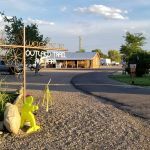 We camped at Outlaw Trail RV Park in a Travel Trailer. Very nice, helpful owners, trying to make improvements to this fairly basic park. Good base to enjoy the many attractions in addition to Dinosaur National Monument. Spotless, reasonable laundry. Very attractive tent sites; nice playground for families with children. We camped at Outlaw Trail RV Park in a Fifth Wheel. Ask owner for recommendations on area attractions. She is a wealth of information. Antica Forma in Vernal has great wood-fired pizza! Very welcoming friendly service. The park is very tidy and apparently has been cleaned up because it is obviously beautifully cared for. The sites are plenty long for our 40 foot MH and tow car. The surface is all neatly graveled and level. 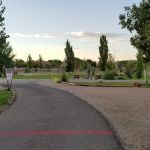 There is a beautiful grass area with a couple of fire pits that have seating around them and picnic areas with a nice playground and volleyball court. It is easy access and the closest RV park to Dinosaur National Park. We camped at Outlaw Trail RV Park in a Motorhome. Older campground (or former trailer park) that the owners are progressively working to improve. The park road is paved; the sites are gravel. The sites are very close together with no shade and no fire rings of picnic tables. The sites are very long and level. The park offers 30 and 50 amp sites. The bathroom/laundry building has been renovated on the outside; the inside is older but very clean. The showers are fully tiled = 25 cents for a hot five-minute shower. Convenient dump station. Easy on/off Highway 40. We hope to return. We camped at Outlaw Trail RV Park in a Fifth Wheel. Nothing to speak of in Jensen but Dinosaur National Monument which is amazing and beautiful. Many other spectacular sites in the area such as Red Fleet State Park (dinosaur trackway) and Flaming Gorge. Lots of shopping and restaurants in nearby Vernal. If you've been boon-docking, this park let's you dump for a $10 fee and shower for $3.00 plus 25 cents for a five-minute shower. New Visitor Center with knowledgeable and friendly staff right across the street from RV park. If you are here to go to Dinosaur National Monument, this park has full hookups, fairly level sites and reasonable prices. It is a buck extra if you use a credit card. Although the highway frontage is a well kept lawn, sites are all gravel, no picnic tables or trees. A utilitarian campground for a specific purpose. Wifi, when it worked, was very, very slow, apparently due to a dispute with the local phone company. This is not a place to recline outside drinking wine and eating snacks. We camped at Outlaw Trail RV Park in a Travel Trailer. This is not a town, but a tired looking settlement with a new state visitor center, a closed gas station and a greasy spoon restaurant food for breakfast. I have stayed at the park time and time again over the past 5 years because we have family out there. Yes they do not have a lot of trees just yet but they did, I was told by a park employee they got a disease which killed the trees, something that could not be controlled and are working on fixing but trees take time to grow. They have large bathrooms with HUGE showers that yes cost quarters but 1 quarter is 5 mins and I can afford that for the care they take in their facility. 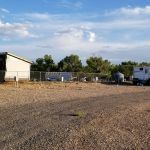 They have an amazing laundry room as well, soda machine, snack machine, they even have wi-fi and the closest RV park to the monument. I will tell you this, I price check every where I stay and they were the best price as well as the best value even though they don't use discounts and are not affiliated with any groups. Yes they do keep a few signs up but I have dealt with CS and for every sign my employer had ever put up it was usually because someone did something to cause it. I have seen the changes in the park these last few years and I say this to the owners, kudos to all your hard work. Cant wait to come visit next year! We camped at Outlaw Trail RV Park in a Fifth Wheel. Ask about the petroglyhs, Josie's Cabin, the monument and the little town Vernal as they have a Dinosaur Museum in town as well and a Heritage Museum ( free to go to). My family and I have also checked out the rafting people next door and they have AMAZING packages of course now I cant think of the name now that I am home lol. I loved the fact it had a playground for kids to keep busy and they have horse shoes and volleyball there as well. Handy to Dinosaur National Monument. Nice park, gravel sites. Very clean restrooms and laundry. The management staff is very pleasant to deal with. Offered an extra discount for cash rather than credit card. We camped at Outlaw Trail RV Park in a Motorhome. Very nice simple rv park, been here 4 times since 2001. Directly across from Dinasour Quarry, super Gravel, dry and not muddy Few trees, but this a desert arid area Clean restrooms, nice laundry Pleasant fried ly owners, kids play area A must stop to visit the Dinasour Momument and Quarry. We camped at Outlaw Trail RV Park in a Motorhome. Are you affiliated with Outlaw Trail RV Park ?